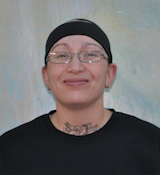 When sixteen-year-old Jackie first came to YouthWorks, she had almost given up hope. She was a high-school dropout, estranged from her family, with no place she could call home. Jackie settled in at YouthWorks and took every training course offered—from culinary arts to river restoration—and worked every job available. And with the support of our YouthWorks staff, she was eventually able to claim her high-school diploma and earn a number of college credits. Today, after a few years away from Santa Fe, Jackie is back with us. But this time, she’s at YouthWorks as Sous Chef Jacqueline Gibbs. In her new role, Jackie works with Chef Carmen Rodriguez in our culinary program as an instructor and mentor to our young people. The turnaround in Jackie’s life happened because of the generosity of people like you. Support from our donors made all the difference in getting Jackie the mentoring and job training she needed to succeed. As we end 2018, we need you more than ever to support the hundreds of young people in our community like Jackie. In today’s political climate, funding we used to count on from the federal government has virtually disappeared. Thanks to the generosity of so many, we’re holding our own, but the needs of “at-risk” young people in our community, unfortunately, continue to outpace our funding. Donate online at the YouthWorks website. Charge a donation by calling YouthWorks directly at 505-989-1855.